Welcome to my new series, the Best Ever! Here is the first recipe in the series, Best… Brownies… Ever. My best friend and her family are visiting this Sunday and I’ve been trying to think of what to make for dessert. I was looking for a new recipe, but couldn’t find anything that piqued my interest. I already have ice cream, whipped cream, chocolate syrup, bananas, and an assortment of chocolate chips, nuts and sprinkles. You know what that means? It’s ice cream sundae time! Sundaes are perfect 365 days a year, they are fun for kids, fun for adults, and totally perfect for a hot Memorial Day weekend. And what’s a must have item for sundaes? Brownies, more specifically my fudgy brownies! I’ve made these brownies for my friend and her family before… a number of times actually. In fact, I’ve made these for practically everyone that I know, over and over again. Why? Because they are crazy delicious and everyone loves them. I mean, just look at them! Don’t you want to sink your teeth into these fudgy delights? I’ve made a ton of brownie recipes, I’ve made box mixes, I’ve changed them up to make other interesting varieties and of course I’ve shared the tasty ones with you. However, I always prefer my precious… these fudgy ones. I’ve been making them for almost 10 years. (10?! Wow, I feel old.) I’ve been obsessed with them since the first time I made them and I still am (for all the reasons that I listed in the original post, which I won’t bore you with again). 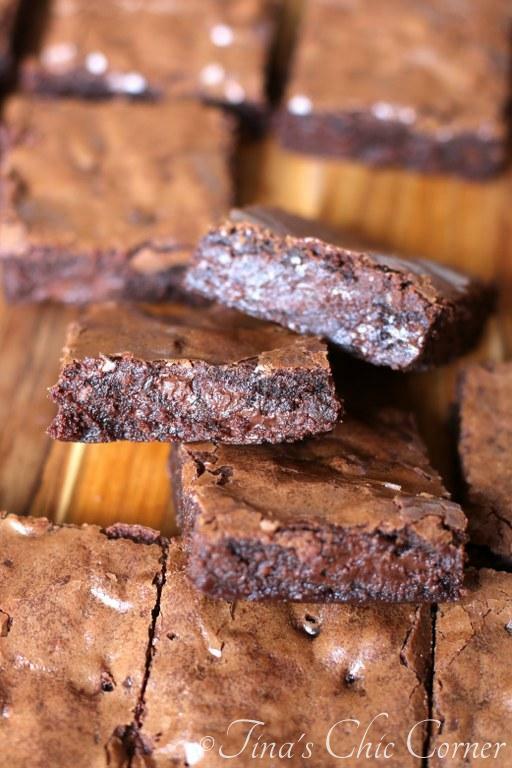 I couldn’t imagine finding a better brownie recipe… ever. Whip these up for some friends, a bake sale at your kid’s school, or just for yourself when you’re having a crappy day. Perhaps do a face plant right into them watching a good chick flick, like one of my favorites, Bridget Jones Diary? Oh you fudgy brownies, I like you very much, just the way you are. I’m not one to try to convince you of anything… for the most part. 😉 However, I’m really passionate about these brownies. I mean I’m giving them the spotlight twice! These are the real deal brownies. I know that once you’ve made them you’ll find these are your go-to brownie recipe too. Alright, so have I convinced you yet that these are the best brownies ever? If yes, then click here for the recipe. Dont suppose you wanna beam up a slice for me? It’d go down a treat with my cup of coffee. Wow! This recipe has a lot of years of backup behind it 🙂 Looks great! It’s so true! We all have recipes we make over and over (and yet those seem to be the ones I never think to share!). These brownies look awesomeeeee. Love the photos too! Have a great holiday weekend!! !